We browsed through the festival’s website together, my friend and I. With the proliferation of semi-professional documentaries (always, always shaky camera – painful to my eyes, at times, much like the early works of my own career: “Sorry, Hakim, Ibu pening lah tengok video tu…”) and dozens upon dozens more of the same works touching upon the same issues and themes over and over again, there are few works that truly jumped out at me and grabbed my attention. But then again, it was the Women’s International Film Festival in Seoul, which, while it focuses on an important, if slightly over-exposed issue, limits itself in terms of the kinds of work that it can show. Alan Shearer's goal celebrations are famous in Romania. What ran through my mind at that moment of time? If you had guessed “something to do with Sascha Baron Cohen,” then give yourself a stuffed teddy bear, because you would be absolutely right (woe betide the person named Borat on God’s not-so-green earth; he will forever be associated, somehow, with Ali G’s alter ego). I have been a big fan right from the very, very beginning, and anything associated with Mr Cohen would always grab my attention. Not that the director, Mercedes Stalenhoef, planned for it that way. 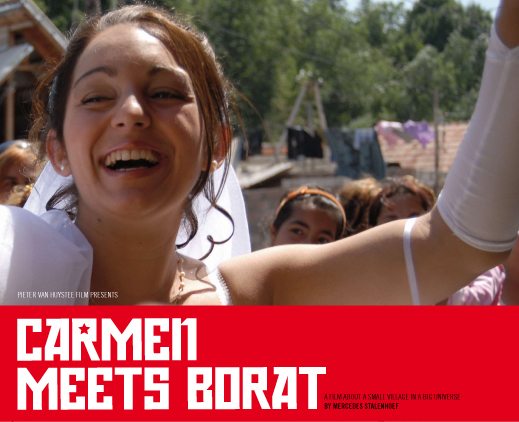 ‘Carmen Meets Borat’ is a documentary that is initially planned to follow the dreams of a young girl named Ionela. Surprised? Carmen is actually the Spanish name she wants to adopt; she doesn’t think that Ionela is a very special name to have. She lives in Glod, in Romania, a place that doesn’t really rank very highly within Romania itself. In fact, the name itself means ‘mud’ (then again, the very name of my hometown, the capital city of one of Southeast Asia’s most prominent nations, also has a similar meaning, so who am I to judge?). Carmen has spent her whole life in Glod, and while she what appears to have typically-local aspirations (she is attracted to the boy next door, etc. ), she also enamoured by the idea of getting out of Glod itself. It is a town that has little going for it, rife with poverty and the most basic of infrastructures. "I'll never let go, Jack..."
Low and behold, one day Mr Cohen would turn up and shoot in the small village itself. You see, he chose Glod to be the representative of Borat’s own hometown in the film, ‘Borat: Cultural Learnings of America for Make Benefit Glorious Nation of Kazakhstan’ (phew). It is famously the town that honestly thought he was making a nice little film about their little community. As is now relatively well-known, they weren’t at all happy when the film itself actually came out. The main bone of contention was over the film’s depiction of the town as, of course, Kazakhstan. 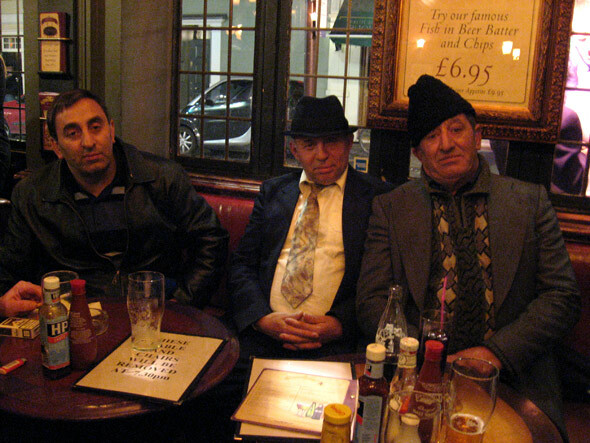 “This is Romania,” one of the locals shouted out in the bar when they recognised the footage from a TV broadcast. From this moment on, then, Ionela plays an almost peripheral role to the bigger things at hand. The focus shifted from her to the villagers wanting to sue the makers of ‘Borat’, intending to make things right and make barrel-loads of money in the progress. That shifted into high gear with the arrival of a high-powered Jewish lawyer from America. The Jewish part is important here, because he himself plays on this factor to get the locals on his side. He encouraged them to sue 20th Century Fox with such rhetoric as, “You and I, we are the same. I am a Jew, and we have been suppressed and downtrodden for a long time. You are also being taken advantage of in the same way. Let us rise up together, and show them that we are not weak.” Or something to that effect (I can’t quite recall the exact words, so there’s your disclaimer). The essence, however, is there, and to me at least, it strikes me as a ridiculous notion to base a call to arms for (it also completely ignores the fact that Cohen himself is Jewish, and half the time his gibberish is really just sloppy Hebrew). She plays the imaginery money game very well. And ridiculous it is. They are led on a merry-go-round with next-to-little chance of success. It is interesting how the film sort of shifted its narrative from following Ionela, to documenting the town of Glod. It becomes, in some small way, a tribute to the spirit of the town. In many ways, there’s not much there, but this documentary goes some way in adding realism and life to what had previously become a laughing stock of a town. But why did it become that? Because it was used in a film. For my part, I had generally allowed for such endeavours. After all, no one really took Borat seriously, except for the people who were not informed enough about him. That was a part of a joke, and it was all it ever was: a joke, made by a comedian. It went on to make a lot of money (part of the reason why the villagers decided to take such a course; money [and its lack] became one of the key factors of the film), but it wasn’t real (though it was funny. Generally speaking, I do not mind for that. After watching this film, though, I did feel like I want to and should modify my stance somewhat. I still think that it was a joke, and it wasn’t as if Cohen wanted to demean anyone along they way, but this film is worth watching because it reminds us that some jokes just aren’t that funny. In some way, without the film, no one would even be talking about Glod itself. The talk was not complimentary, and the film offered us a perspective of what it feels like not only to live in such a place, but also to be used and somewhat abused. Not only by Cohen, but also (and perhaps more cruelly) by the unscrupulous Jewish lawyer who made…nay, pushed them to further humiliate themselves when such humiliation wasn’t necessary. The Romanian 'Eastenders' didn't have high ratings. Thinking about it further, in some ways, Ionela herself is presented as a sort of symbol representing the town. She represents it in almost all its gloom and doom, but, through dreams of emigration and a new life, with rays of sunlight at the end of the day. In making a documentary about this, just in feature fiction films, Stalenhoef could have gone about it from several different approaches, but her decision to trust in Ionela should be applaued. While the town itself is somewhat blessed with a number of entertaining characters providing fair entertainment value, Ionela serves as the emotional anchor, somewhat, of the sort of journey the village of Glod went through. While the director’s intentions may be fair, the reaction of the townsfolk, with Borat in mind, was somewhat sceptical. Check out the twist in this when it did happen; almost every camera becomes a representative of an entity who wants to screw them over again. In looking back on this first review of a documentary on this site, I realised why I had put this off for a fair number of months even. I was grappling with the idea of passing a sort of judgment not only on fictional realities, but also on actual realities. I can get away with it with fiction films; reviewing documentary films, by the inherent closeness it has to the real world when compared to fiction films itself, feels very much like passing serious judgments on someone’s life itself. What firmed my decision, then, was the realisation that this is a documentary well worth watching. I may have been initially attracted by the brand of Borat, and sometimes Glod doesn’t feel all that exciting, but I suppose you take some and give some. What you get at the end is a film with a whole lot of heart, one that captured a life of a young girl in a small town at an important time of their lives. It nearly changed my mind about the whole ‘if it’s funny, it’s OK’ mantra when it comes to jokes, as well. And the camerawork? Very steady. My mother would approve. Fikri‘s friend was interested in how a foreign director who never set foot in Romania made a compelling documentary about it.